We didn't have our digital underwater camera when we came through the West Indies, so you'll have to just believe us when we say how cool all the fish and corals are! Meanwhile, some of the underwater animals (or their skeletons) are accessible to our older camera. 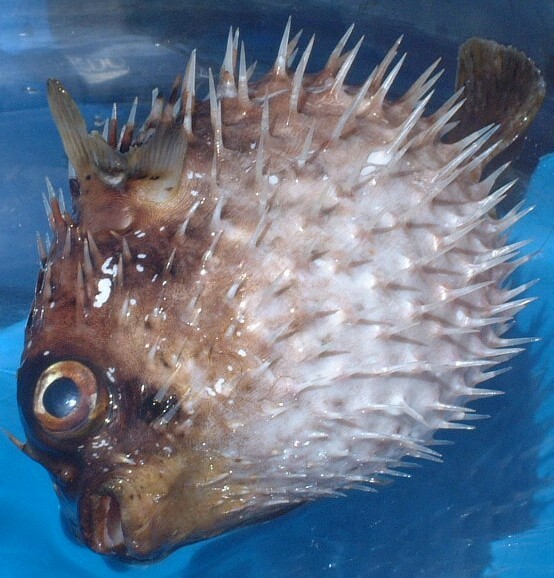 This unfortunate spiny puffer fish ended up floating inside the reef at Windward, Carriacou. We scooped it out of the water with a bucket, and brought it aboard to be photographed. Yes, it was quite dead, and no, we didn't pick it up with our bare hands. This squid must have been fleeing some predator, only to land itself firmly on our aft deck one night. 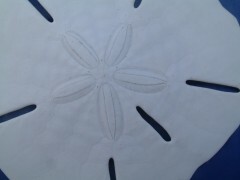 It was about 8 inches long, without extending the tentacles. Another dozen and we could have had our own calamari stir-fry. Yum. 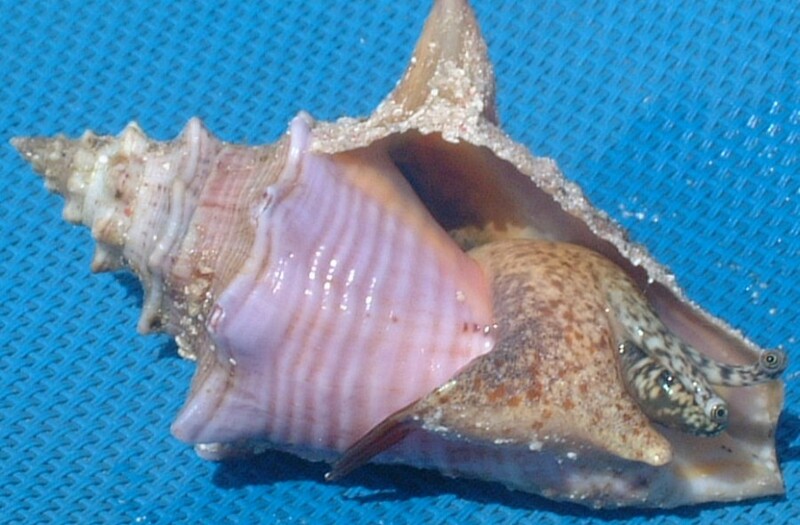 The queen conch used to be prolific in the islands, but has been over-harvested, and now is found only in very deep water. Snorkeling, we found this immature conch and brought it aboard to look at before returning it to a deep eel grass bed far from anchored boats. Coming out of its shell, it inspects the world with its two eyestalks, and moves about by digging its operculum (shell-like foot) into the sand and clawing its way along. We're looking forward to seeing some true coral reefs farther south, but have enjoyed the coral-covered rocks which abound on these more northern island coasts. In the shallower water, black spiny urchins cluster in the rock crevices during the day and wander onto the sand to feed at night. 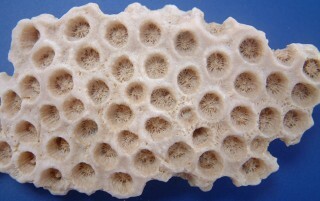 Six-holed keyhole urchins inhabit the sandy bottoms on the reef fringes. It's rare to find a live one, as they tend to bury themselves in the sand during the day. 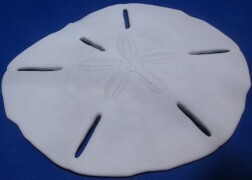 Their skeletons are recognized as thin, fragile sand dollars. A lot of Category 3,4 and 5 hurricanes have hit the Eastern Caribbean in the past few years, and much of the coral has been destroyed. 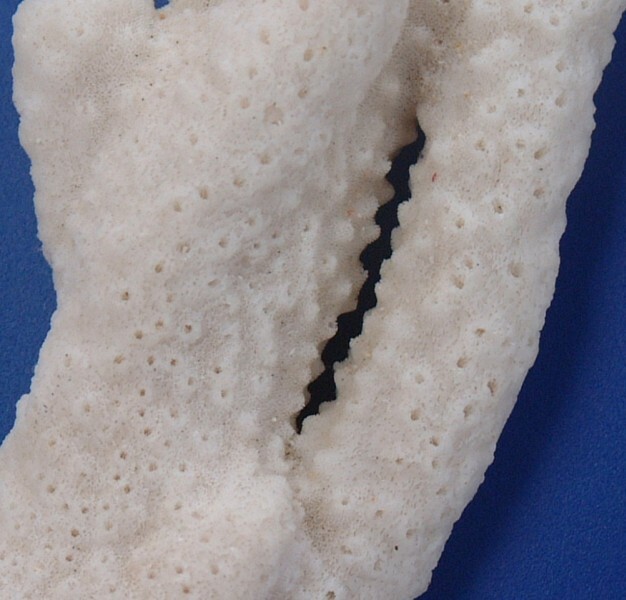 Washed up on the beaches and bleached, bits of coral skeletons can be found. 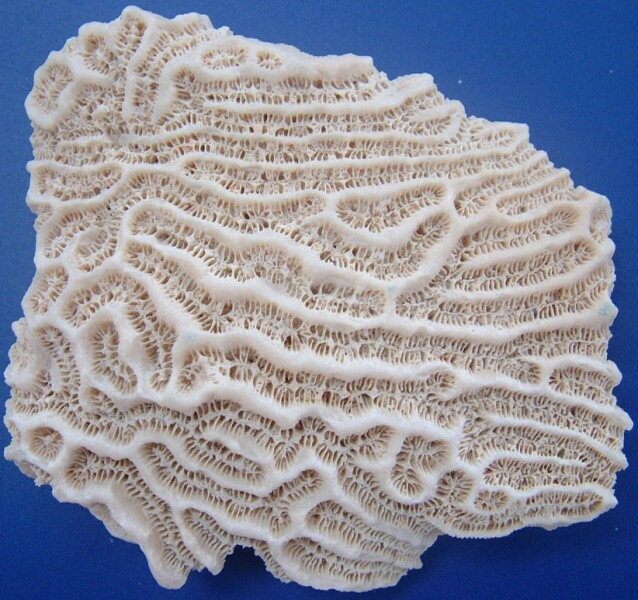 The sharp-hilled brain coral is one of about 10 brain coral species found in the Caribbean. It's characterized by sharp crested "hills" much narrower than the valleys. 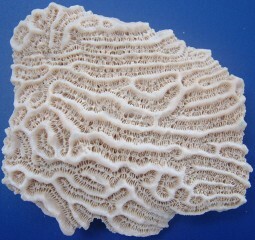 Alive, it can be either a crust, or form a hemisphere, common to brain coral. The worn-down edges of the polyp cups make it hard to tell whether this is the skeleton of a normal boulder coral, or the large-cupped boulder coral. Branched hard corals include the thin finger coral which is usually gray or brown. Other common branched corals in the Eastern Caribbean include the Stag-Horn and Elk-Horn corals, but these species are the most fragile and are now rare off the islands which have had the most hurricane damage in recent years.